The Bingham Diaries: TTA: Better Late than Never! TTA: Better Late than Never! Did you know that today is TUESDAY? Of course you did. You look like the kind of person that has their life together. Myself, on the other hand, forgot it WAS Tuesday until the nice lady at my doctor's office reminded me. At any rate, we're late with the Tuesday Tell-All! Aack! The Tuesday Tell All is all about YOU! Link up your blogs, and yes, we're talking your family blogs, your craft blogs, your sewing, cooking, & reading blogs, or anything else you've got! It's a blogging free for all! And BECAUSE you're such an understanding bunch, we have a free printable for you. Just to make up for our lateness. 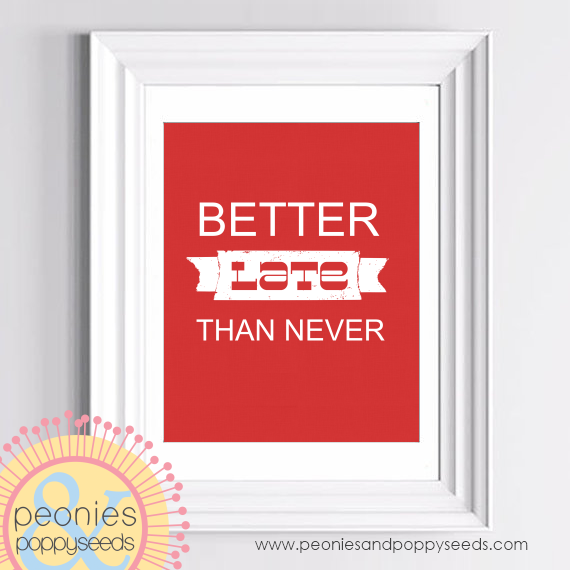 This Better Late Than Never wall print is an 8x10 size that would look fab in your home. Now... get linking!